Jews have been an integral part of Hot Springs, Arkansas, throughout the town’s unique history. Its famous natural springs were designated by the federal government as a natural resource preserve in 1832, as people from around the country flocked to the 143-degree water as a medical treatment for arthritis and other bone ailments. Hot Springs is still home to a vibrant Jewish community today. Jacob Mitchell, a Jewish immigrant from Galicia, arrived in Arkansas in 1830 along with his two brothers. Mitchell somehow acquired an old Spanish land grant to a portion of the springs, and he and his heirs spent the next 40 years unsuccessfully fighting the federal government in court over their rights to the springs. 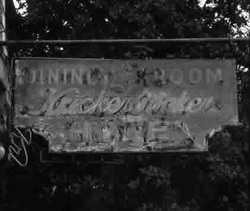 Despite this conflict, Mitchell bought a hotel in Hot Springs in 1846 and opened a bath house. Mitchell performed a number of roles in the town in addition to running his hotel and bath house business. He owned a bar and billiard hall, as well as a livery stable, while also serving as a justice of the peace. He even began to call himself “doctor” since he often prescribed herbal remedies to his guests at the hotel. ​Mitchell may also have been influential in convincing Jacob Kempner, a Galician-born Jewish businessman who lived in Little Rock to move to Hot Springs. Kempner owned a stagecoach line that connected the two towns, and opened stores in both of them. Despite the exploits of these early pioneer Jews, a significant Jewish community did not develop in Hot Springs until after the Civil War, when Jewish immigrants from the German states fanned out across the region. These traveling peddlers eventually settled in the river and railroad towns of the South, acting as crucial links in the expanding market economy. Hot Springs appealed to a number of these merchants because it was a natural tourist attraction. Emanuel Burgauer came to Hot Springs after fighting for the South in the Civil War. He married Babette Guggenheim, who had come to town to visit the springs with her family. The steady supply of tourists provided young Jews in Hot Springs with greater access to potential Jewish spouses than Jews in other small Southern towns enjoyed. Burgauer opened a furniture store in Hot Springs. Three brothers, Moses, Simon, and Albert Mendel came to town in the late 1870s. Each of them established a dry goods store, and they became one of the most prominent Jewish families in Hot Springs. As early as 1872, a group of these Jewish settlers formed the town’s first Jewish congregation and began meeting in a rented room. Calling themselves the House of Israel, the group constructed their first temple in 1885. Hot Springs Jews also created other important Jewish institutions, including a Jewish cemetery and a B’nai B’rith lodge founded in 1877. An Orthodox congregation, Shearith Israel, was first formed in 1907, after a wave of Eastern European Jewish immigration to Hot Springs. While Shearith Israel closed in the 1930s, another Orthodox congregation, Beth Jacob, was founded in 1950. Most Hot Springs Jews in the late 19th century were merchants, owning dry goods, clothing, shoe, jewelry, and furniture stores. Simon and Rosa Meyer opened a general store in the 1880s. Their daughter married David Lockwood, who founded Lockwood’s store in 1904. Their son Harold took it over in 1946 and ran it until the 1980s. 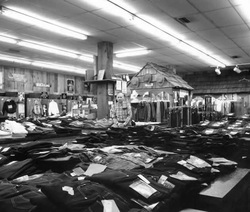 His daughter reopened the store in 1989, making her the fifth generation of their family to own a retail store in Hot Springs. Following the German Jews, ambitious Eastern European Jews began to arrive in the city in the 1890s, and began to open clothing stores, dry goods stores, and many other commercial businesses. One of these merchants was Morris Moscowitz, who opened a men’s clothing store in Hot Springs in 1895. Morris’s son Grover was appointed as to the federal district court in Brooklyn by President Calvin Coolidge in 1925. Born in Russia, Peter Gartenberg came to Hot Springs in 1893 and opened a dry goods store. His son Leo and grandson Robert later joined the business, which grew into a large department store over the years. As in so many other Southern towns, Hot Springs Jews played an active role in local civic life. Bernard Gross came to town in 1881 and opened a dry goods store. He later started a mortuary, which became very successful. Gross was instrumental in the creation of the local volunteer fire department, and served as its longtime chief. He also served on the local city council, as did J.C. Wolf. Ernest Klein, a pharmacist who owned his own drug store, served on the Hot Springs School Board. When the Hot Springs Rotary Club was founded, four of the 15 charter members were Jewish. Three Hot Springs Jews have been elected president of the local Chamber of Commerce. Hot Springs’ Jewish community was undoubtedly helped by the large number of Northern Jews who visited Hot Springs to enjoy the thermal waters of the area. In fact, several restaurants and hotels serving kosher meals opened to cater to these Jewish tourists. These included the Knickerbocker Hotel, the Metropolitan Hotel, and the Balfour Hotel, which was named after the British foreign minister who had approved Jewish settlement in Palestine after World War I. The Balfour was founded in the 1920s by Isadore Schulman and Clara Zach, and had a chapel so observant visitors would not have to ride on the Sabbath to pray. Eli and Eve Miller opened the Metropolitan, and owned a kosher restaurant in the Eastman Hotel. The thermal springs also led to the creation of the Leo N. Levi Hospital. Rabbi A.B. Rhine of House of Israel realized the need for a hospital to serve the many poor Jews who came to Hot Springs for medical treatment. The local B’nai B’rith lodge took the idea to their regional convention in 1903 and won support for a B’nai B’rith hospital in Hot Springs. In 1910, the national B’nai B’rith signed on, assessing all of their members 25 cents to help pay for the project. The local Hot Springs chapter donated $2500 to the cause. The hospital, which served indigent patients, was completed in 1914 and was named after Leo N. Levi, a beloved past national president of B’nai B’rith who had died in 1904. It was the first national Jewish hospital specializing in rheumatism and blood diseases. Although it was funded by B’nai B’rith and had a kosher kitchen, it accepted patients of all faiths; a majority of its patients over the years have not been Jewish. 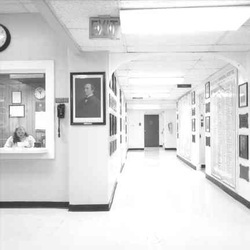 Regina Kaplan became the hospital’s administrator in 1916, and stayed in the position for 35 years, overseeing the hospital’s growth from 25 beds to 125 beds. Hot Springs’s Jewish community thrived as tourists and hospital visitors provided the critical mass necessary to support many Jewish institutions. All of the synagogues, kosher hotels, and the hospital were all located within a few blocks of each other in downtown Hot Springs, which had become the Southern version of the Catskills resorts in upstate New York. Unlike other small Jewish communities in the South, Hot Springs was insulated for a while from demographic decline due to its tourism industry. Over the years, a number of Jewish visitors decided to move to Hot Springs to enjoy its thermal waters and temperate climate. In 1937, 325 Jews lived in town. By 1968, an estimated 600 did. As more advanced treatments for bone and joint problems were developed, Hot Springs declined as a center of medical tourism. Most of the Jewish hotels and kosher restaurants were closed by the 1950s. The Balfour lasted until the 1960s. Also contributing to this decline was the state’s crackdown on illegal gambling, which had long flourished in Hot Springs with state officials looking the other way. After these changes took root, Hot Springs experienced a sharp decline in its Jewish population. The Orthodox congregation Beth Jacob closed in the early 1990s. In 2001, about 150 Jews lived in town. Despite the decline, the Hot Springs Jewish community remains active and vibrant. The thermal waters and the pleasant quality of life still attract Jews to Hot Springs. The remaining congregation, House of Israel, continued to operate a religious school and employed a part-time rabbi as of 2017. While the golden age of kosher hotels and multiple congregations has passed, Hot Springs remains an important center of Jewish life in Arkansas.